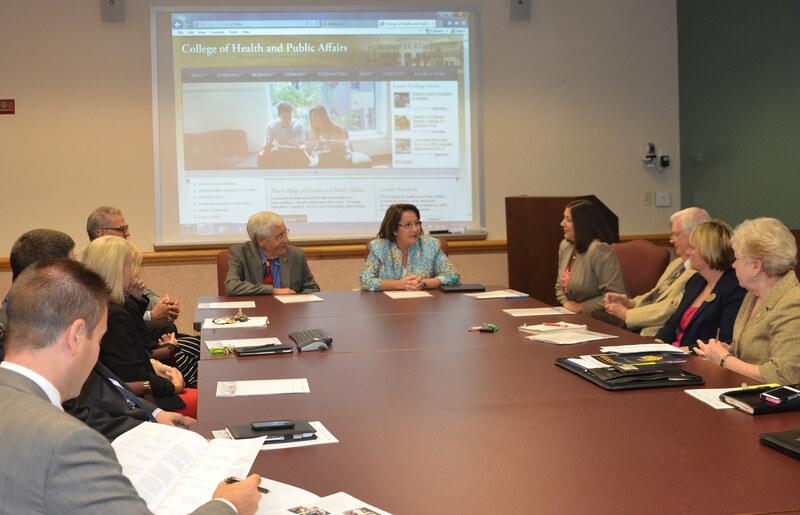 The University of Central Florida’s College of Health and Public Affairs recently met with Mayor Teresa Jacobs and members of her administration to discuss how to strengthen partnerships between Orange County and the academic community. Leaders from UCF and Mayor Jacobs discussed enhancing civic engagement programs and internships to create a strong foundation for the region’s future generation of leaders. UCF offers 212 degree programs and is one of the most dynamic universities in the country. More than 60,000 students, from 50 states and 145 countries, attend classes on UCF’s main campus and its 10 regional campus locations. Meet the Judge Juvenile Court Program –The Department of Criminal Justice, Orange County’s Office for a Drug Free Community and other partners work on this program together. Corrections Re-Entry Initiatives – The Department of Criminal Justice and Orange County Corrections Department are partners in this program. Evans Community School – The College of Health and Public Affairs and Orange County Public Schools are engaged in this joint initiative. UCF AmeriCorps VISTA Program – The Center for Public and Nonprofit Management and Orange County Public Schools collaborate on this initiative. Student placements for service-learning or clinical training – The Department of Health Management and Informatics and Florida Department of Health in Orange County; Department of Health Professions, Department of Communication Sciences and Disorders and Orange County Public Schools; School of Social Work, School of Public Administration and multiple county agencies collaborate on these programs. The College of Health and Public Affairs has more than 9,300 enrolled undergrad and graduate students and is a leader in improving the health and welfare of communities – locally and around the world – through education, research, service and community partnerships. Many of the college’s students gain real-world experience while addressing needs in the community through service-learning. For example, every year, nearly 200 health services administration majors complete a semester-long internship in a health care organization, gaining invaluable insight and personal knowledge. A collection of photos from Mayor Jacobs’ visit with the UCF College of Health and Public Affairs are available on Flickr for use by the media.